All Star Dad Baseball Discounts Apply ! 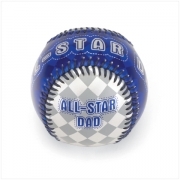 The All-Star Dad baseball is a great gift for every dad in your life. A great gift by itself, you can personalize it by having the young ball players in his life autograph it for a truly unique gift that's sure to be a treasured gift for years! Soft baseball of cotton and polyester and synthetic leather cover.